My ‘French Kids’ School Lunch Project’ is back by popular demand! 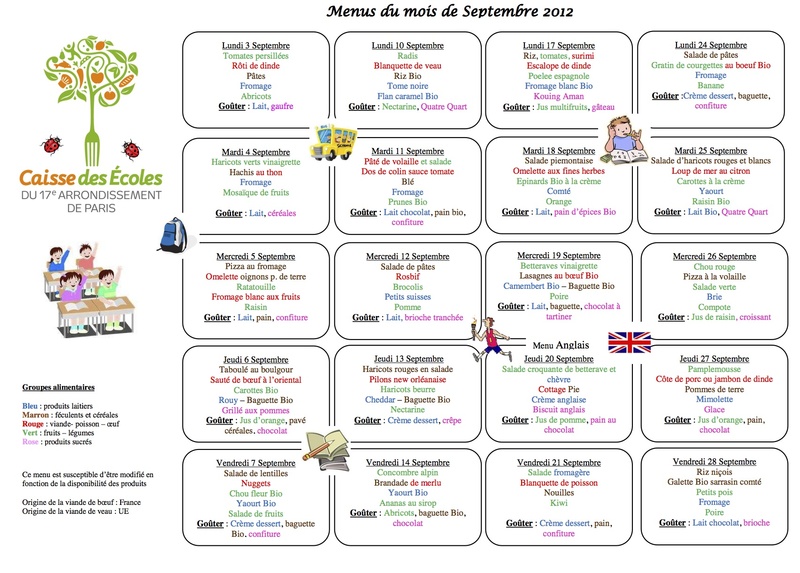 For the yummy menus French kids are eating this week in Paris, read on! These menus come from the 17th arrondissement (similar to a borough), a very mixed part of Paris, with two former industrial zones (Batignolles and Épinettes) which are rapidly gentrifying. It’s off the tourist track (and not even listed in many tourist guides), so this is about as ‘ordinary’ as you can get — for Paris, that is! But their school lunch menus are far from ordinary! Note the ‘English menu’ on Thursday. Each month, children are served a ‘typical meal’ from a different country. This is meant to introduce French kids to world cuisines and broaden their palates. Seems like the menus the rest of the month are doing that anyway! As usual, the meals follow a four course structure: vegetable starter; main dish with vegetable side; cheese course; dessert. All meals are served with fresh baguette (eaten plain, usually one piece per child!) and water. No flavoured milk, juice, sports drinks, or pop. No vending machines. No fast food or junk food. Food for thought! « Beef tongue, goulash, grated organic carrots: What French Kindergarteners are eating this week! I’m SO glad you’re still posting these! Reading the menus always gives me inspiration for new things to cook. I am passionate about food and I have a large family of 7 including three young children between the ages of 1 & 4. I was so happy when I found your blog and your posting of the weekly menu. It makes my life so much easier and enjoyable because I pretty much copy that same menu and recreate best I can at home with some substitutions. My whole family loves to get together and eat healthy quality meals in which everyone has been involved in the preparation. Thank you so much from the bottom of my heart. I am so happy to see how my children are learning to eat quality healthy meals, savor each bite, make dessert part of the meal, and know to respect their bodies when they are full. My children attend private school and you would think it would be better but let me tell you, it is unbelievable what is served. Pizza and hot dogs every week, McDonalds, Blimpy, nuggets etc. Nothing is ever freshly prepared and it’s expensive to choose this option. I pack their lunches instead and send leftovers that they can heat in the microwave(eww:(() but it’s the best option. I work as a chef so this topic is near and dear to me. Thanks for posting the menus. I thouroughly enjoy them!! Oh, how I wish we could implement this in the U.S.! My kids are no longer in school, and rarely bought lunch because of the horrible food offered (in least in our schools; I’ve heard not all schools are bad). But I know that too many of the schools resort to high-fat, high-sugar, even junk food options, to keep costs down they say, or to satisfy the kids’ already formed desire for this type of food. I do love the French approach!